Now on the blog, one of my favorite police procedurals from the 1950s, “The FBI in Peace and War”. The episode of October 15, 1952 is titled “The Solid Citizen”. The story concerns a “solid citizen”, who is fraudster facing murder charges. The show is sponsored by Chesterfield cigarettes, Dentyn and Beeman’s Pepsin. 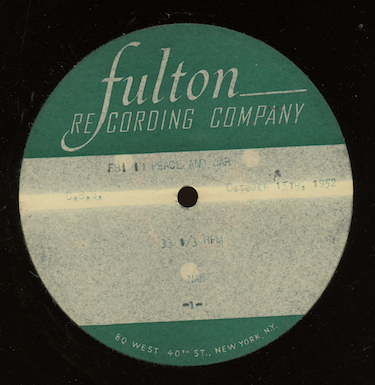 The show was transferred direct from an original 16” lacquer cut by Fulton Recording Company in New York. This particular episode of the program is floating around among collectors and is taken, I think, from this same disc, but I was able to get a better transfer. Here’s another episode of the odd syndicated drama series, “Imperial Intrigue”, following up from our last post. This unnumbered of the episode begins with Charles IX on this deathbed. 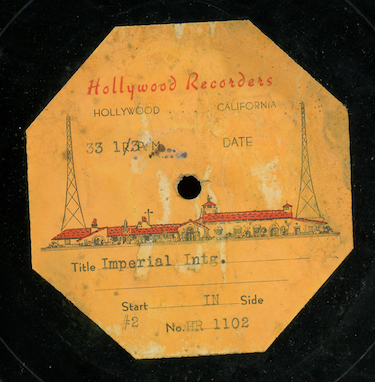 The program was transferred from an original Hollywood Recorders 16” single-sided shellac transcription, matrix number 1102. Next up on the blog, a real rarity I haven’t been able to find out much about. 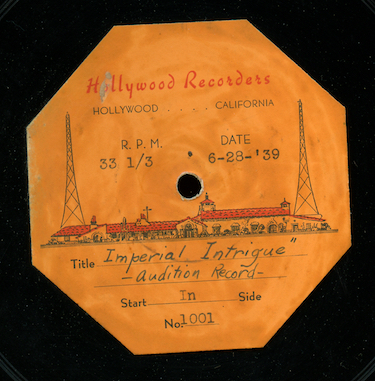 It’s “Imperial Intrigue”, a drama program dated June 28, 1939. The plot concerns French King Charles IX and the royal intrigue involving his mother Catherine in August 1572. The program was written by Lloyd L. Harris. Goldin’s database has three entries for the director, Don Brody, for work on a KFWB program in 1939 and a couple of other shows in 1946 and 1953. I found some listings for this program on Los Angeles area radio stations in 1939-1940, but I’m not sure if it was heard outside of California. I also found an obit for Vern A. Milton who did the sound effects for the program; the article mentions the show as originating on KGB (now KLSD) in San Diego. Our show was transferred from an original Hollywood Recorders 16” single-sided shellac transcription, matrix number 1001. The disc is dated June 28, 1939 and noted “Audition Record” on the label. The transcription was pressed by Allied. Let me know if you have some more info on this oddity. You know you should be buying US Savings Bonds, right? 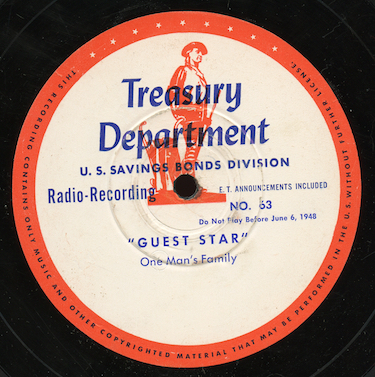 Here’s another installment of the US Treasury Department’s long-running series, “Guest Star”. Program 86 in the series features guest Bonita Granville and Jack Webb in a dramatic sketch, “The Road to Yesterday”, written by Harry Lawrence. The plot concerns a dead woman reflecting on her life. David Rose and the Savings Bond Orchestra kick off the program with “I’ll Be Seeing You”. 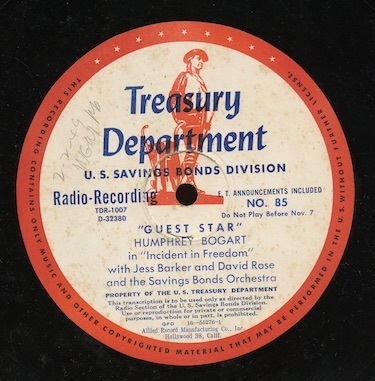 The program was digitized direct from an original Treasury Department 16” vinyl transcription, matrix number TDR-1004 D-32349. You want to buy some US Savings Bonds, right? If I can’t convince you, perhaps this week’s “Guest Star” can. Humphrey Bogart drops in on this week’s episode to star in a fifteen minute drama called “Incident in Freedom”. Your announcer is Jess Barker and we hear David Rose and the Savings Bond Orchestra. Our show was transferred to digital direct from an original vinyl Treasury Department transcription, matrix number TDR-1007 D-32380. The disc was pressed by Allied Record. Here’s another episode of the long-running public service program, “Guest Star”. Usually, the show features musical guests, but here’s one with a short dramatic sketch. 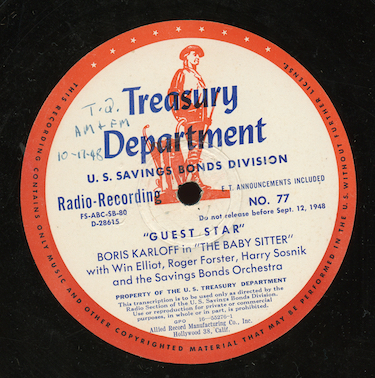 Program 77, originally heard the week of September 12, 1948, stars Boris Karloff in “The Baby Sitter”, a piece about a stranger that breaks into a house to find food and finds a little boy. Before the drama, Harry Sosnik and the orchestra perform “Boulevard of Broken Dreams”. The announcer is Roger Forster. 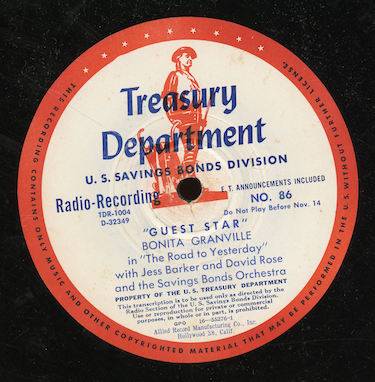 The show was transferred from an original 16” vinyl Treasury Department transcription, matrix number FS-ABC-SB-80 D-28615. A highlight of the blog this week is an usual, previously lost audition for a syndicated program. Jim Tully was an author and columnist who came to fame for “riding the rails” in the 1910s, turning his experiences into a popular book, “Beggars of Life” in the mid-1920s. The book was turned into a silent film of the same name with Louis Brooks. The movie was recently restored and released on blu-ray. Tully was one of the first journalists to cover the film industry. As a free-lancer, unaccountable to the studios, he gained a reputation as “the most hated man in Hollywood” for his frank and open writing about Hollywood stars. “Beggars of Life” was a series of dramatized incidents from his popular book. In this book, we hear “Kangaroo Court”, which is about a kind of initiation ceremony done by prisoners thrown in jail for vagrancy when someone new would arrive. Tully introduces the drama. I haven’t been able to find any documentation on a broadcast run of this series, but would guess it dates from the mid to late 1930s. Our program was transferred to digital direct from an original single-sided 16” shellac transcription pressed by Hollywood Recorders, matrix number HR-1007. Next week, we’ll hear a series of five minute syndicated shows that Tully produced where he narrates stories about famous people he’s known. Our last post this week is another entry in the series “Front Page Drama”, syndicated by Hearst Newspapers to promote their “American Weekly” newspaper supplement and produced by Langlois & Wentworth, New York. 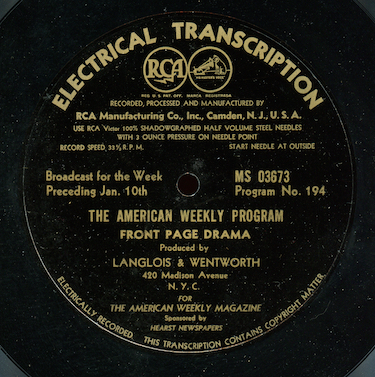 Program 195 in the series was originally heard January 16, 1937. “The Field of Honor” tells the story of what happens to a young man after a father doesn’t allow him to marry the man’s daughter. “Front Page Drama” was usually distributed with another Hearst program, “Jungle Jim”. We’ll have the flip-side of this disc with that show next week. Our mp3 was transferred from an original sixteen inch Victrolac transcription pressed by RCA, matrix number MS 03673. Here’s another in our series of a half-dozen programs in the series “This Is Your FBI”, dubbed from early 1970s syndication masters. 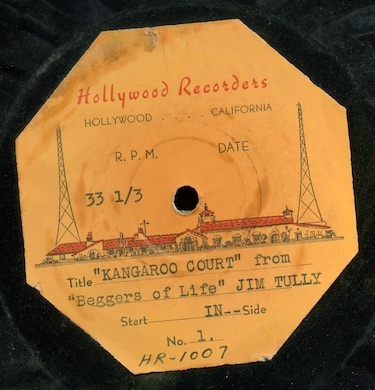 Normally, later syndication versions of old time radio programs wouldn’t be of much interest to collectors, but I’m posting these because of the incredible sound. When producing the syndicated version, the producers took out the original 50s era master tapes and dubbed them to create the dubbing master heard in this post. The commercials are omitted, but the program is otherwise as it was originally broadcast. Our episode this week is “The Dime-A-Dance Stick-Up”, originally broadcast August 15, 1952. The story concerns a woman, working in a dance hall, who gets mixed up with a man injured in a bank job. I think this might be a program in the series not circulating among collectors. Our mp3 was transferred from an original full-track quarter-inch reel to reel tape running at 15 inches per second, captured at 24 bit/96 kHz from a ten inch reel. The programs were edited for this 1970s syndication run at Gold Star Studios in Los Angeles.